will not find their way into their way here. compiled by John Adams and this website. Branch updates: Two new bars: EC1V 9NR Serata Hall, 207 Old St. 5 Keg Beers E11 4AF Solvay Society Taproom. Arch 223, off Madeira Road. Opens 4pm Thurs/Fri, 12 Noon Sat, all days till 11pm. Signature Brewery have opened the Collaboration on Hoe Street E17. Keg only, more foody but can drink only if you want. In the newish buildings at the top of the market, by the bus stops, think it used to be a Asian restaurant. 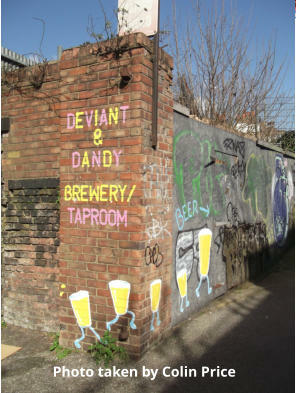 Deviant & Dandy, Arch 184/5 Nursery Road, London E9 6PB. ABQ London 18 Bohemia Place, E81DU is a cocktal bar? Mon-Tue: Closed. Wed-Fri: 5pm - 12am. Sat: 3pm - 12am. Sun: 3pm - 10pm. Brew Club, 18 Bohemia Place, E8 1DU Opens on Fri, Sat, Sun sells beers from local breweries. all the places in Bohemia Place E8 appear to serve their beer under pressure..
past on 10th January, unit to let. be available. Food is from the Pieminster range. EC1, Bavarian Beerhouse (bavarian beerhouse ltd), 190-196 city road, ec1v 2qh. Closed. Building being developed. 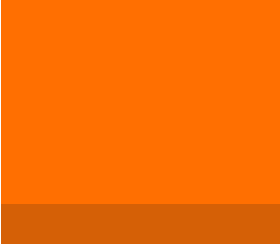 EC1, Corner Bar (--individual--), 125 Central Street, EC1V 8AP. No real ale. 3 handpumps unused. 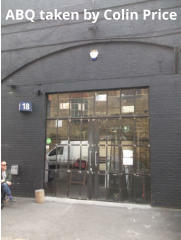 EC1, Grill On The Market (Blackhouse (Living Ventures Restaurants)), 2-3 West Smithfield, EC1A 9JX. Closed for financial reasons EC1, Lino (Wright & Bell), 90 Bartholomew Close, EC1A 7EB. Opened in former Lino factory. More restaurant than bar. Prides itself on recycling and reusing and local produce. Keg Beer. EC1, Lost River (--unknown--), Canto Court, 122 Old Street, EC1V 9BD. Having opened by Feb 2018 closed by May 2018! EC1, Nomad (Ei Group), 58 Old Street, EC1V 9AJ. Opeartor now:- Decco London Ltd EC1, Nuala (Ntd Restaurants Ltd), 70-74 City Road, EC1Y 2BJ. Closed suddenly in Jan 2019 EC1, SINGER TAVERN (Barworks), 1-5 City Road, EC1Y 1AG. Real cider usually available. Guest beers now down to two. 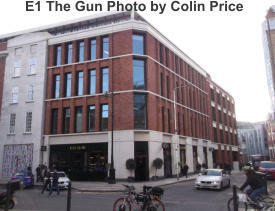 EC1, SPORTS BAR & GRILL (FARRINGDON) (Stonegate), Unit 3 Cowcross Place,19-25 Cowcross St,, EC1M 6DQ. No longer Cask Marque accredited. EC2, BARLEY MOW (Remarkable Pubs), 127 Curtain Road, EC2A 3BX. Old Rosie cider now available. EC2, BABBLE (Stonegate), 45 Old Broad Street, EC2N 1HU. Rebranded as a Be at One in March 2019. EC2, Bedroom Bar (--individual--), 68 Rivington Street, EC2A 3AY. Renamed LIGHTHOUSE BAR & CLUB. Real ale no longer available nor any draft beer. EC2, Worship Street Whistling Shop (Fluid Movement), 63 Worship Street, EC2A 2DU. Renamed London Cocktail Club. EC2, SLUG & LETTUCE (Stonegate), 2 Love Lane, EC2V 7RF. No longer Cask Marque accredited. EC3, Bavarian Beerhouse (Bavarian Beerhouse Group), 9 The Arches Crutched Friars, EC3N 2AU. Closed due to increase in rent. EC3, CRAFT BEER CO. (--other--Craft Beer Co.), 29-31 Mitre Street, EC3A 5BZ. Cider available in bag in boxes. EC3, Abbey (Stonegate), Clare House, 30-33 Minories, EC3N 1DD. Renamed Slug & Lettuce. EC4, Grand Union (Star (Heineken UK)), Rolls Passage-Chancery Lane, EC4A 1HL. Still closed - lease now on Star website - Jan 2019 EC4, Pitcher & Piano (Urban Pubs & Bars), 67-69 Watling Street, EC4M 9DD. Was an Argentinian restaurant. Reopened and renamed JUNO ROOMS. Currently on soft launch. Refurbished by Urban bars. Keg beer, bottles and cans. EC4, Corney & Barrow (Drake & Morgan), 3 Fleet Place, EC4M 7RD. Renamed Little Fable. EC4, Tappit Hen (Davy's (Davy & Co Limited)), 21-23 St Swithens Lane, EC4N 8AD. Part of Davy's chain.Modern Wine bar and restaurant. 3 keg beers. E1, Archers (ei group), 42 osborn street, e1 6td. Closed whilst being convert to the BUXTON, a pub with 15 rooms. E1, Bar & Block (Whitbread Inns (Whitbread)), 66 Alie Street, E1 8PX. Attached to the Premier Inn. Modern Bar and Restaurant. 12 keg lines. E1, Dispensary (--individual--), 19A Leman Street, E1 8EN. Closed following increase in rent. E1, Duke Of Wellington (Mendoza), 12 Toynbee Street, E1 7NE. Closed for redevelopment into pub/hotel E1W, CAPE BAR (Parity Bars), 5 Thomas Moore Sq, Nesham Street, E1W 1YY. Reopened as the MORETOWN BELLE.operated by Belle Pubs & Restaurants. Modern bar with sports TV, 3 pool tables and 3 dart boards. 3 cask ales from the Marston's range. E2, Nelsons Head (--individual--), 32 Horatio Street, E2 7SB. Reopened January 2019 after refurbishment. No cask ale at present .Guinness and 2 US craft beers E3, Old Duke Of Cambridge (--individual--), 20 Reeves Road, E3 3PH. Converted to flats by Nov 2017 E4, Mount (--individual--), 30-32 Old Church Road, E4 8DD. Closed. E6, Central Hotel (--individual--), 150 Barking Road, E6 3BD. Having closed in 2017, planning granted to convert to residential with a commercial unit (later changed to nursery) on the ground floor. E6, Earl Of Wakefield (--unknown--), 72 Katherine Road, E6 1EN. Converted to church 2014, nursery & HMO E7, Simpsons (--unknown--), 342 Romford Road, E7 8BS. Closed since 2015. 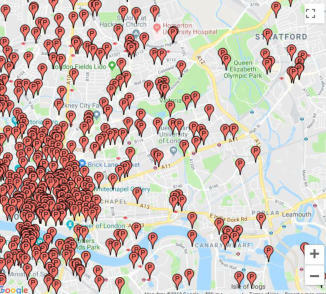 Three planning applications refused since 2016, the last two involved retaining the pub with flats above. E8, Prince Arthur (Gorgeous Pubs), 95 Forest Road, E8 3BH. Closed. E9, HEMINGWAY (Star (Heineken UK)), 84 Victoria Park Road, E9 7JL. Sold to Wellesley Capital Investment Ltd (associated with the Wellington Pub Co) E10, Oliver Twist (Whitbread), 90 Church Road, E10 5JP. Conversion to 9 flats approved August 2013 and completed the following year E11, BIRDS (Star (Heineken UK)), 692 High Road, E11 3AA. Sold to Wellesley Capital Investment Ltd (associated with the Wellington Pub Co) E11, Eagle (Toby Carvery (Mitchells & Butlers)), 73 Hollybush Hill, E11 1PE. No Real Ale. E11, Lord Rookwood (Ei Group), 314 Cann Hall Road, E11 3NW. Owner now --individual--. Bought by LORD ROOK WOOD LIMITED July 2018 for £1.5m ex Ei Group.Closed 2013. Planning app granted to convert upstairs to flats and on land adjacent to pub. E11, NORTHCOTE ARMS (Ei Group), 110 Grove Green Rd, E11 4EL. Reported as no longer owned by Ei Group (awaiting Land Registry confirmation). E12, Earl Of Essex (Ei Group), 616 Romford Road, E12 5AF. Dec 2018: Planning app approved keeping pub/restaurant on ground floor with 9 flats above E12, Royal British Legion (MANOR Park) Club (Newham Council), 30a Church Road, E12 6AQ. Now a for hire event venue E12, Ruskin Arms (--unknown--), 386 High Street North, E12 6PH. Already reported closed, license surrendered following incident E14, 5B Urban Bar (--individual--), 27 Three Colt Street, E14 8HH. Reopened as a Live Music venue. E14, Aberfeldy Tavern (Brakspear Pub Co.), 26 Aberfeldy Street, E14 0NU. Closed c.2013 and demolished the following year - the promised replacement pub never materialised E14, CRAFT BEER CO. (Star (Heineken UK)), 576 Commercial Road, E14 7JD. E14, GREENWICH PENSIONER (--individual--), 28 Bazeley Street, E14 0ES. Reopened. E14, FINE LINE (Fuller's), 10 Cabot Square - Fishermans Walk, E14 4DH. Renamed LIMEHOUSE. E14, Lord Nelson (Star (Heineken UK)), 1 Manchester Road, E14 3BD. Closed.. E14, Lord Stanley (--unknown--), 55 Carmen Street, E14 6NW. Closed. Planning app from 2013 timed out. A 2017 plan to replace with new pub and flats was rejected E14, Royal Charlie (Wellington), 116 Chrisp Street, E14 6NL. Demolished E14, STAR OF THE EAST (Ei Group), 805a Commercial Road, E14 7HG. Reopened by the Old Spot Pub Company setup by EI Group with partners Dave Ford (Director at Field to Fork) and Bernard O’Neill (Director at Productivity Mentor), both experienced operators, currently run an award-winning pub in Warwick and other restaurants in London. Fuller's London Pride and 3 changing real ales from the likes of East London Brewing and Rebellion. E15, LEYTON STAR (--individual--), 116 High Road Leyton, E15 2BX. Now Cask Marque accredited. E15, Manby Arms (--unknown--), 19 Water Lane, E15 4NL. Nov 2018: Planning app to demolish and replace with flats retaining facade E15, Trowel & Telegraph (Enterprise Inns), 51 Church Street, E15 3JR. Demolished 2015 E16, Anchor (--unknown--), 20 Star Lane, E16 4RG. Work taking place 2018 in relation to student accommodation scheme E16, New Gog (--unknown--), 38-40 Freemasons Road, E16 3NA. Purchased by NOTTING HILL HOME OWNERSHIP LIMITED in 2015 but still no planning app Feb 2019 E16, Royal Oak (--unknown--), Woodman Street, E16 2LN. Planning app to build 3 extra floors retaining part of pub at ground floor and basement level approved Mar 2018 E17, CYPRUS EMPIRE (--unknown--), 20 Woodford New Road, E17 3PR. Renamed EMPIRE LOUNGE. E17, FLOWERPOT (Ei Group), 128 Wood Street, E17 3HX. No longer has Cask Marque status. E17, Kelly's Sports Bar & Grill (--individual--), 30 St James's Street, E17 7PF. Renamed Goergio's Sports Bar & Grill. E17, Grove Tavern (--individual--), 74 Grove Road, E17 9BN. Flat conversion underway in 2014 but still covered by hoardings in 2018 E17, Waltham Forest Corporation Sports & Social Club (--club--), Town Hall, Forest Road, E17 4JF. Having closed 2016 demolished during 2018 E17, Wild Card Brewery-Ravenswood (--individual--), Unit 7, Ravenswood Industrial Estate, Shernhall Street, E17 9HQ. Renamed Wild Card Brewery Barrel Room. E17, WILD CARD BREWERY-LOCKWOOD (--individual--), Unit 2, Lockwood Way, E17 5RB. Renamed WILD CARD BREWERY TAPROOM. E18, White Hart (Ei Group), 159 High Road, E18 2PA. Reopened and renamed GALLERY as a fine dining establishment. The ground floor bar has a couple of keg beers. There is also an upstairs cocktail bar.